As autumn arrives we may spend more time at home and take up indoor pursuits, perhaps home dressmaking – a traditional domestic skill. Home sewing is far less common now than in our mothers’ and grandmothers’ day, but was once part of daily life, practised in almost every household. Most of our female forebears learned to sew as soon as they could handle needle and thread, this being considered a fundamental feminine accomplishment. Before the machine age, young girls from all walks of life learned hand-sewing, often being taught at home, alongside other household tasks. Many girls ultimately fashioned whole garments, stitching their own linen caps, kerchiefs, aprons and shifts, baby clothes and men’s shirts and handkerchiefs: sewing and embellishing basic dress articles, including the family’s linen, was seen as a woman’s duty. For privileged ladies needlecrafts remained chiefly a genteel pastime, for they could always summon help from servants or employed professional garment-makers. However, generations of ordinary women made, altered and repaired clothes for themselves and their families, a necessary economy in poorer households before ready-made shop-bought clothing became widely available. For many working women sewing at home also provided a vital form of income. From the early-1800s schools were encouraged to include needlework in the curriculum, and in Victorian England many dame schools, village schools, Sunday schools and orphanages taught sewing. As the education system expanded, domestic subjects became compulsory for girls, to equip them for their future roles as wives and mothers and potentially for jobs in domestic service, dressmaking or millinery. Many Victorian societies and charitable organisations also organised sewing instruction for disadvantaged children in their locality; workhouses taught pauper boys tailoring and girls sewing, knitting and other domestic skills, to prepare them for adult life in the outside world. Successful home sewing depended on available resources. Linen or cotton aprons, shifts, shirts and other loose or unshaped items were relatively easy to make, but fitted clothes like dresses needed a reliable template to follow when cutting out fabric. Home dressmakers often copied an existing garment, unpicking seams to create a flat ‘model’ which was traced onto thin paper or directly onto the lining material of the new garment. Friends and relatives also shared and borrowed such patterns based on existing clothes, professionally-made original garments being especially coveted for the purpose. By the mid-1800s periodicals aimed mainly at the rising middle classes, like The Englishwomen’s Domestic Magazine, began to issue free small-scale paper garment patterns alongside their fashion illustrations, or readers could apply for them by post. Patterns for items like underwear, bodices and mantles were all printed on one large sheet of paper, the home dressmaker then tracing off the required parts and adjusting them for size. In time, commercial pattern companies became established beginning in America: two of today’s familiar names, Butterick and McCall’s, were founded respectively in 1863 and 1870, Butterick operating in Britain by 1876. Their cut-out pattern pieces in white tissue paper had notches and perforations by way of directions: no printed markings as yet. Using such patterns, ideally the dress lining was first cut out and fitted directly against the body: when a good fit was achieved then the lining pieces became the model for cutting out the more costly garment material. Clothing fabric of all varieties was purchased in large stores, small shops, market stalls and itinerant drapers or peddlers. Affordable sewing ‘notions’ – needles, thread, buttons, trimmings and so on, later called haberdashery – were widely available. Even in Brighton’s village-like Fiveways area there was once a haberdashery shop between Hythe Road and Preston Drove: run by two elderly ladies, this was still going in the early-1980s. Rising demand for paper dressmaking patterns was fuelled by the arrival of the domestic sewing machine. The earliest attempt at a working machine is usually said to be that patented by Thomas Saint in London, 1790, for sewing leather. However it was American Elias Howe who patented the first practical lock-stitch sewing machine using the two threads familiar in domestic machines today. Isaac Singer followed in 1851 with an improved, more efficient model, the name of Singer becoming synonymous with the new apparatus. In 1856 Singer launched a sewing-machine agency in Glasgow, his machines reaching British home dressmakers through retail shops. Other brands also emerged and by the late-1860s around 20 different domestic sewing machines existed. 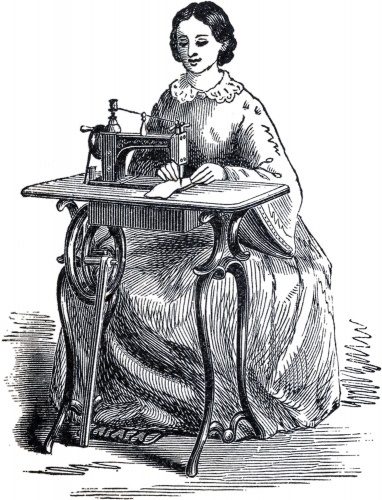 Many early sewing machines were expensive at around £10 to £15, although some models were cheaper and ultimately prices in general reduced by the late-1800s. Sometimes friends, relatives and neighbours clubbed together, sharing a hand-crank or treadle machine; some acquired machines using hire purchase systems. Access to a sewing machine brought considerable advantages to the home dressmaker, although the ease with which long seams and lengths of trimming could now be sewn encouraged the use of ever more stitching and complex trimmings. The art of dressmaking had become both simpler, and more complicated. Electricity provided a new form of power from the 1880s, Singer developing its first electric sewing machine in 1889, although many British homes were not connected to electricity until after the creation of the national grid in 1926. During the later 1920s and 1930s, more urban households began to acquire the new electric machines, while simultaneously clothing styles grew much simpler, no longer requiring the traditional precision of fit and becoming easier to run up at home. Pattern companies now became more competitive, attracting home dressmakers by making their patterns easier to use. In 1921 McCall pioneered printed patterns on large sheets of tissue with dart placements, notches for matching pieces and other useful information such as naming each separate piece, following this in 1924 with more detailed directions. Eventually other companies did likewise, creating more user-friendly patterns with clear instructions that formed the prototype for those we use today, enabling many ordinary women to enhance the quality and style of their wardrobes.